Over the past decade the world of contemporary art has experienced the beginnings of a tectonic shift. Its contours have been increasingly visible in major international art shows of the past five years. Whereas ten years ago exhibitions such as New York's Whitney Biennial, the Venice Biennale, or Documenta in Kassel, Germany, included just a few major video installations, in 1997 and 1999 the use of video became commonplace. Banks of monitors, projected video images filling entire walls, and tiny video screens were a regular, even predictable presence, employed by artists who might or might not even consider themselves "video artists." 010101: Art in Technological Times charts that trend in installations, in single-monitor works, and in digital works that employ video projection. But the dramatic emergence of video technologies as a mainstream art medium is only one byproduct of a more encompassing shift in contemporary culture. E-mail; cell phones; DVD movies; CD audio disks; MP3 files; desktop, laptop, and palmtop computers; the World Wide Web; digital cameras; and video camcorders—communication, by image or word, occurs more and more along networked digital pathways, via digital devices aggressively marketed by a global economy. Like it or not, high tech has arrived as a component of everyday life, and artists are adopting it in the studio, deploying it in the gallery, inhabiting it on the Internet, and making work that reflects its presence in society today in a stunning range of ways. This situation is the subject of 010101. The increasing use of video by artists—although just a single indicator of a larger shift—is a case in point. Over the past ten years the downward-spiraling cost of computers, digital camcorders, and software-editing tools that can pump video directly into a desktop computer brought video production within the grasp of virtually any artist who wanted to do it. The results are now visible in galleries around the world. In essence, video stopped being "video art" and is now just art—another acceptable means to say what the artist wants to say. The video camera became a tool, not a crusade or an artistic calling, and video installations started showing up in galleries formerly devoted to painting and sculpture. The same thing happened to photography its the late 1980s, and it will, in all likelihood, happen to what we might think of as "computer art" over the next few years. Digital technologies have arrived as part of the basic tool set, and they aren't going away. It's worth emphasizing here that the infusion of technology-based artworks into the art arena, and the background effect of technology on traditional art practice, hasn't produced a new "style" or "movement" and that these works do not constitute a single medium or mode of art making. Rather, they open a field of possibilities that artists are exploring on all scales, from the production of individual objects to extensive cycles of works, installations, and multiyear projects. The variety of work on view in 010101 reflects this fact. Although it represents only a fraction of a much larger outpouring of technology-related art, the exhibition encompasses a range of video practices, sculpture, design projects, computer-driven installations, traditional drawings and paintings, new artworks commissioned on the Internet and for the gallery, and a Web site for dialogue, public programs, and background information on the show. 010101 is an exploration of a transitional moment in art and exhibition making, and as such, it has deliberately avoided seeking stylistic consistency. Both in format and in terms of the art presented, the exhibition offers deliberate and dramatic contrasts in the use of technology and attitudes toward it. In contrast, Davies's Ephémère (1998; pp. 62 65) is a phantasmagoric abstract landscape, presented in the form of an immersive, three-dimensional, virtual-reality environment. The user or participant (viewer would be too passive in this case) navigates through it actively, and no two journeys will ever be identical since the experience is a synthesis of the participant's decisions and the computer's response to them. Davies's world has a distinct look and feel, and the roughly fifteen-minute trip moves along a more or less programmed trajectory. But the specific form it takes is like any journey across a complex landscape: precisely what the traveler sees and feels will depend on complex variables that are impossible to fully predict or reproduce. Cardiff's video walk offers another set of revealing contrasts ( pp . 52 53 ). Unlike Kalpakjian or Davies, she starts with "real" images—video shot mostly in the Museum itself, with a voiceover and soundtrack that blend scripted narrative by the artist, ambient sounds recorded onsite and audio collage from a variety of other sources. Visitors can check out a small digital video camcorder with high-quality headphones and retrace Cardiff's steps through the Museum by following her directions on the soundtrack and the image itself, moving from gallery to gallery and space to space. The effect is similar to being inside the artist's head but looking out at the real world as she sees it, as if in a reverie she's experiencing. Like Davies's invented world, it's totally engrossing. But whereas Davies and Kalpakjian make fiction feel like reality, Cardiff rewrites real experience—both her own and the viewer-participant's—as fiction. 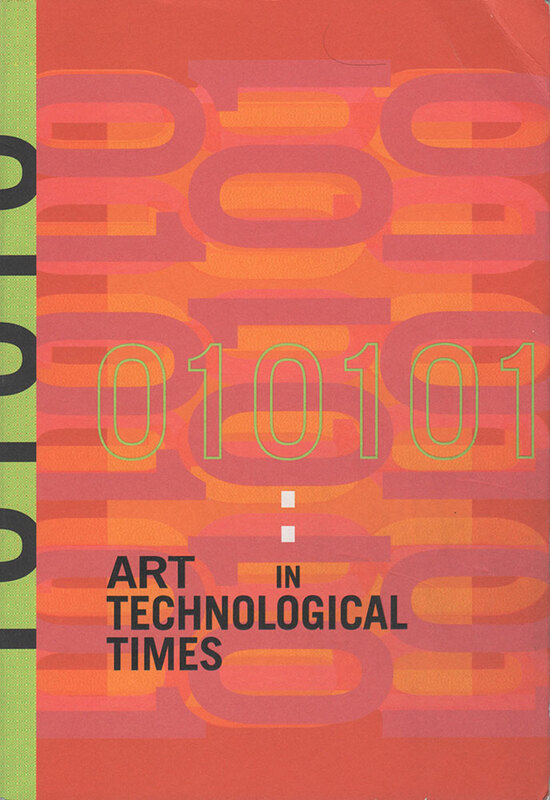 None of this work could be made without the computing power, comparative economy, and availability of today's digital editing, design, and display tools, and the art on view throughout 010101 demonstrates the direct and indirect impact that the electronics and software industries have had on art making. Relatively affordable video projection systems allow artists such as Heike Baranowsky to take a single video stream, copy it four times, and flip it twice, projecting the result as a mesmerizing, kaleidoscopic trip around Paris in her installation AUTO SCOPE (1996-97; pp. 32 35). Digital video editing allows Euan Macdonald to show two jet planes flying side-by-side, seemingly mating in the sky (pp. 98-99). Jeremy Blake uses the same basic tools to create a unique blend of video, scavenged film clips, computer design, and sound in his work (pp. 46-49), something tike a real-time cross between Mondrian, B movies, and Star Trek. Other artists—such as Lee Bul, Karim Rashid, and Shirley Tse—take advantage of the products and capacities of the plastics, industrial design, and packaging industries as a starting point for sculpture and installations unimaginable in pretechnological times (pp. 96-97, 118-19, 136-37). In some cases, the artists in 010101 still work with traditional media, notably painters such as Kevin Appel, Chris Finley, and Adam Ross (pp. 28-29, 76-77, 122-23). Here, high-craft painting displays visual effects, geometries, distortions, and translucency in ways more commonly seen on a computer screen, yet the work is 100 percent handmade. They watch as the computer proliferates new ways to visualize space and form, then register their fascination in pigment rather than pixels. This may be painting in technological times, but a close look at the lapidary, pristine surfaces achieved by Appel and Ross leaves no doubt about the depth of their commitment to the medium and their understanding of its demands and joys. They are painters, unapologetically and unambiguously.